USPs are all the rage these days, because they make you stand out in an increasingly crowded marketplace. Given how full of character – and, yes, “quirky” even! – B&Bs and guest houses can be, they’re in a great position to sell themselves in this way. Having said that, figuring out your USP can sometimes be a bit of a head-scratcher, so here’s some food for thought. Do you grow your own fresh produce? Do you do some home baking? Do you have a log fire? Who has booked your property in the past few years? What kind of people are they? What are they interested in? Have they written reviews on your website, or on TripAdvisor? If so, what have they said? Have any of them told you that they booked your property for a special reason? Has a certain local event or landmark brought them to your area? In terms of finding something unique, customer feedback can be your most valuable resource. If, having done all this, you still feel that your property still doesn’t have an obvious unique attribute, there’s always the option of creating one. If you’re in an especially beautiful part of the world, you could study some local history and offer walking tours that focus on that. 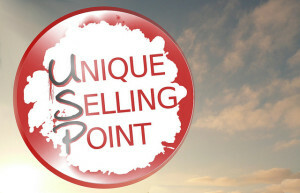 Seasonal unique selling points are another great way to keep business coming in all year round: you could focus on an outdoor facility, like a patio garden, in summer, and an indoor facility, like a real log fire, in winter. Once you’ve settled on a unique attribute that you’re confident about, the other most important strategy is not to undersell it. Make sure it’s prominent on your website and try to complement it, if possible, with the best possible photos.